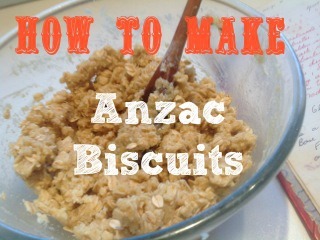 ANZAC Day is looming and I’ve started to practice making my ANZAC biscuits again. Thank heaven for my Mum’s cookbook which, perhaps, some of you have read about recently? There was also a huge jar of “Afgans” too. Later on in life I then made these as part of my “Saturday Morning” slice repertoire that was a ritual when we had the Darlington Post Office in the hills of Perth. Lots of our customers used to just pop in for a piece of whatever I had cooked on a Saturday morning whether they were doing business or not. So – on to the recipe. This biscuit keeps very well and is supposedly why they were nicknamed the ANZAC biscuit – evidently it was a good one to send to soldiers based overseas, one that would still be edible on arrival. My version of the Anzac today is much smaller, and no doubt the recipe back then was a much harder variety too. 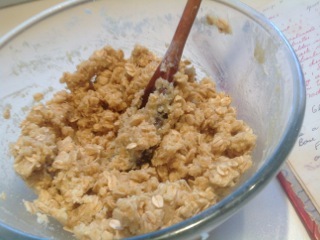 I gather all the dry ingredients together and place them in a bowl and mix thoroughly. Then whilst doing that I melt the butter and pour it into the dry ingredients and mix well. Then I dissolve the soda and syrup with the boiling water and add that to the mix too. Next, I mix it all together well and then roll into firm balls and press down with a fork. 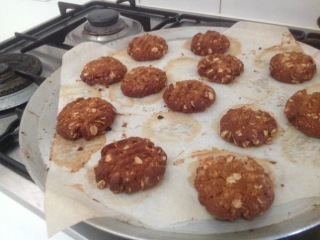 I bake them for about 15-20 minutes and – voila – ANZACS that are just yummy. Last week I was making up one of the beds in one of our guest rooms at Peppermint Lane Lodge while listening to the morning show on TV. The presenters were talking to two ladies who were responsible for the 5000 Poppies exhibition to be opened at Federation Square in Melbourne on ANZAC Day. What an inspiration they were. To see the stunning field of crochet, knitted, felted, crafted poppies on display head to Fed Square, on April 25th 2015. The poppies will be displayed in commemoration of Australia’s 100th Anniversary of the Gallipoli Landing. There is a web site 5000 Poppies with lots more information as well as some great Poppy patterns. I was inspired to get knitting to make a poppy for this occasion and I sent off my first poppy to Melbourne last week. It’s a national event and they have asked any one of us to send a poppy if we’d like to – any shape, form and style – and it’ll be included in their trail of poppies. I think the commemoration for those that fought is wonderful. On May 16 and 17th 2015, Peppermint Lane Lodge is having its first Sculpture Trail called “Follies by the Ferguson” as part of the annual Dardanup Arts Spectacular Art Trail. The opening night is on 15 May 2015. At the Lodge we’ll have various sculptures of all shapes and sizes which will be placed around the Ferguson River on our property. All the contributing artists are amateurs and we’ve had such a lot of fun (and hard work) preparing and placing the pieces. It’s also been a great community project. Most sculptures are from around the local area but there are few ring-ins too. One of my permanent static installations along the trail at PLL is named “Wood Henge” and I’ve decided to carpet this area with a small mat with a knitted red border filled with poppies of different shapes and sizes (my ANZAC mat) – a very small ephemeral piece to commemorate the ANZAC history, and an emulation of the 5000 Poppies and the Tower of London exhibitions. As you can see, it’s been a busy time at the Lodge one way and another. Anyway, I hope you’ve enjoyed this post. I hope you cook up some of my Anzac biscuits, perhaps knit a poppy, and also get to come visit us here at PLL during the Dardanup Arts Spectacular in May. Have I inspired you to make a poppy or bake Anzac biscuits perhaps? Would love your comments … in the comments section below.